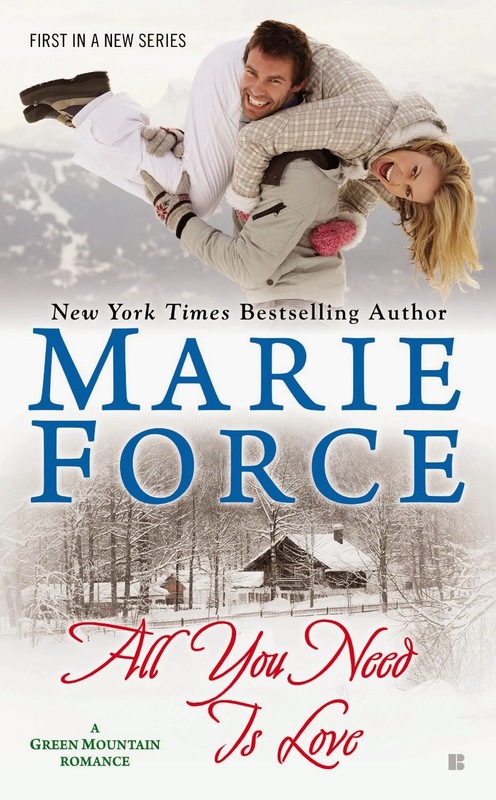 With more than 2.5 million books sold, Marie Force is the New York Times, USA Today and Wall Street Journal bestselling, award-winning author of more than 30 contemporary romances. Her New York Times bestselling self-published McCarthys of Gansett Island Series has sold more than 1 million e-books since Maid for Love was released in 2011. She is also the author of the New York Times bestselling Fatal Series from Harlequin’s Carina Press, as well as the Treading Water Series and numerous stand-alone books. All You Need is Love, book 1 in her new Green Mountain Series from Berkley Sensation, was a New York Times and USA Today bestseller in February. The second book, I Want to Hold Your Hand, will be out in June, and the third book, I Saw Her Standing There, is coming in November. 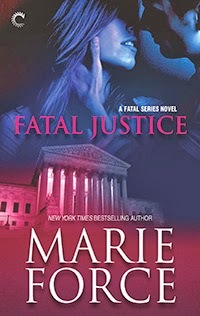 In 2014, Marie will have eight mass-market print releases—the first five Fatal Series books from Harlequin and the first three Green Mountain Series books from Berkley. While her husband was in the Navy, Marie lived in Spain, Maryland and Florida, and she is now settled in her home state of Rhode Island. She is the mother of two teenagers and two feisty dogs, Brandy and Louie. 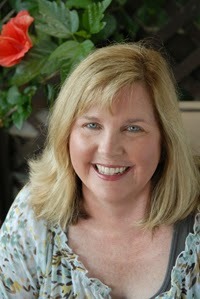 Join Marie's mailing list at http://marieforce.com/ for news about new books and other possible appearances in your area. Follow her on Twitter@marieforce and on Facebook at www.facebook.com/MarieForceAuthor/. 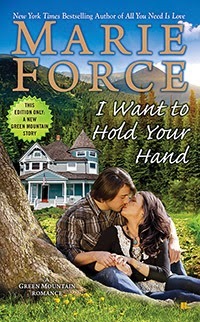 Join one of Marie's many reader groups by viewing the complete listing at http://marieforce.com/connect/. Contact Marie at marie@marieforce.com. Read Janga's review of All You Need is Love here. Marie recently took time from her busy writing schedule to answer some questions for us. Please give her a warm welcome! Welcome back, Marie! It’s a pleasure to have you visit with us here at The Romance Dish. You recently released All You Need is Love, the first book in a new series. Please tell us about the series and what readers can expect from this first book. Thanks for having me! I always love to visit with your community. The new Green Mountain Series is about a family in Vermont that runs the Green Mountain Country Store in the fictional town of Butler. Lincoln and Molly Abbott have ten children, five of whom help their father run the business while the other five contribute items to the store, including maple syrup, beaded jewelry, wood working and Christmas trees. It sounds so appealing. How does the tone of this series differ from your McCarthy’s of Gansett Island books? Will they appeal to the same readers? In the Green Mountain Series, the Abbotts are very committed to their lives in the mountains whereas the McCarthys are all about beaches and boats and island living. The Abbott family dynamic is similar to the McCarthys in that the siblings are close and in each other’s business the way the McCarthy siblings are. I do believe the Green Mountain Series will appeal to readers who enjoy the McCarthy Series. At first glance, Cameron and Will, the heroine and hero of All You Need is Love seem an unlikely pairing. What is it about these two that convinced you they belong together? I enjoyed the fact that their differences made them attractive and intriguing to each other. She sleeps with her cell phone in her hand. He doesn’t own one. She grew up watching family sit-coms on TV and yearning for siblings and families like her fictional favorites. He grew up in a family of ten kids and hardly watched TV. The one thing they have in common from the beginning is an overwhelming attraction to each other that only grows stronger with every hour they spend together. I really enjoyed writing these two characters from different worlds who discover they have all the most important things in common. Our reviewer, Janga has fallen in love with the Abbot family and is hoping that each of the siblings will have his/her own story. What are your plans for this family? Will they each have their own book? Do you have a timeline in mind for the release of those stories? I hope to do a book for each of the Abbott siblings. So far I’ve written Will’s story in All You Need Is Love, Hannah’s story in I Want to Hold Your Hand (June 3), and Colton’s story in I Saw Her Standing There (November 4). Next up in book four is oldest brother Hunter’s story in And I Love Her (March 3, 2015). It’s been four years since you visited us here at TRD. How has your life changed in that time? Oh wow! It would be easier to say how my life hasn’t changed. J My books have really taken off in the last few years. I left my 16-year day job at the end of 2011. I moved into a lovely new home with my family in 2012. I hired a full-time assistant in 2013, and this year I also have a full-time accountant working with me, among other part-time helpers. Our days are busy and full of exciting challenges. The best thing, by far, are the readers who have discovered my books and become faithful fans and friends. What would readers be surprised to discover about you? The last time you were here it was to launch Fatal Affair, the first book in your popular romantic suspense Fatal series. On March 24th, the seventh book in that series, Fatal Jeopardy will be released. Fans of Sam and Nick would like to see this series continue for a long time to come. What are your plans for the Fatal books? There are a lot of print readers who I'm sure will be very happy to hear that! With three series going at full speed, I’m really busy! I just finished I Saw Her Standing There, Book 3 in the Green Mountain Series, and will write one more Green Mountain book this year as well as Fatal Scandal, Book 8 in the Fatal Series. I’m currently writing Gansett After Dark, Book 11 in the McCarthys of Gansett Island Series, and hope to get Book 12 out this year, too. In my “spare” time, I’m working on a new project that I’m really excited about. So lots going on and much more to come from all my series. Will you be attending any conferences or book signings this year where readers will have an opportunity to meet you? I will be at the RT Book Lover’s Convention for the day on Saturday, May 17, and will be attending the Berkley Publishing Lemonade Social and getting together with some of my readers in New Orleans while I’m there. We’re hosting my first Reader Weekend in Newport, Rhode Island on Memorial Day Weekend. I’m holding a launch party for the Green Mountain Series at the Vermont Country Store in Weston, Vermont, on June 28 that everyone is welcome to attend. I’ll be at the RWA conference in San Antonio on July 23-26 and heading to Australia and New Zealand for the romance conferences in Sydney and Auckland the weekend of August 8-10 in Sydney and August 15-17 in Auckland. Readers can find out more about all of these events, including registration information, on my website at www.marieforce.com. Wow! That's a busy schedule! It’s always a pleasure to chat with you, Marie. Thank you for visiting with us today. Would you like to ask our readers a question? Thanks so much for having me! I’d love to ask your readers what it is about series that keep them coming back for more. I’m happy to give away a signed copy of All You Need Is Love, Fatal Affair and Fatal Justice to three respondents. Look forward to chatting with you! Okay, Readers, leave your comments for a chance to win one of the above signed books. Deadline for leaving comments is Midnight (EST), March 21st. Revisiting characters is one of my favorite parts of reading a series. My favorite part too, PJ! Great series characters become like True Life friends! Hi, Marie! I love series books because they update you on the characters you have already read about. I agree, Cathy. It's like getting a visit from good friends. Memorable, real characters make a book special for me. In a series, I get the wonderful opportunity to visit with characters I like and meet new ones. It's a win/win! I really enjoy Marie's Gansett Island books. The new series sounds great. Thanks for visiting. It's the characters for me too. A series lets me hold onto them for longer. There is nothing better than having a complete series on hand & have a back to back reading marathon. The best part of series for me is revisiting characters from previous books and seeing what is happening to them. That seems to be the big draw for most of us. I love seeing what my past characters are up to. Welcome, Marie! All You Need is Love is waiting for me on my Kindle. I'm looking forward to meeting your Abbott family! I adore Marie's books, and I love how she takes the time to interact with her fans. The Gansett Island books are the best. I agree, Samantha. I've had the opportunity to meet Marie a couple times and she's just as lovely to her fans in person as she is online. Great interview! I can't wait to read All You Need. What keeps me coming back for more? A strong connection to the setting/characters/family. Strong writing that is effortless to read, and a face-paced, well-developed plot. LOL! Too true! There's just no turning back, is there? Thanks for popping in, LS! I read almost exclusively on my Kindle these days but many readers I know prefer print. It's awesome that they'll be able to enjoy these wonderful books! Wonderful post and most enjoyable books. Best wishes. Thanks for dropping by, traveler! I can't get enough of the Fatal Series! Book 7 comes out next Monday and I can't wait to find out what Sam, Nick, Scotty & the rest of the gang has been up to!! I became hooked on Marie with the Treading Water series and can't wait to discover the other series too. I love family series. I can't wait to read yours. It's so good reading about families and how the siblings at the end of the day are always there for one another. They sort of take on a second family for the reader. And seeing characters come back is the most interesting. Right there with you, Carol. I love a family series! I love the way she writes. Her characters and the destinations make you want to go there, see the area and meet them. I enjoy her series books as they allow you to see whats happening to characters you have already read about. I'm a big fan of hers. The plot and the portrayal of the characters are meaningful and make the series memorable. I do enjoy reading series books. I guess I'm not ready to say good bye to them and are still able to keep up with them while i meet new friends I really hate to see a series end.It like leaving old friends behind. I'm never ready to say good-bye to a well loved character. Guess that's why I enjoy a series so much too. The author's voice - which means you care for the characters and pretty much anything else that is written! The author's voice is very important and Marie has one that I enjoy immensely. They do become like family, don't they, Donna? An amazing talent, Marie pulls the reader into her penned communities and characters whether she takes you to Gansett Island, Vermont mountains or her fictional DC. Character development, strengths, weaknesses bring her characters meaning and strength - she will truly have you waiting anxiously for her next book. it's the characters, and wanting to see how the characters from the earlier books are doing - it's fun to visit with them again! I love being able to visit with them again. Sometimes, an epilogue just isn't enough. I like the feeling that I belong to the community and that I am familiar with the area. I feel like I know and care about the inhabitants. There's a closeness, a bond that exists between the reader and the people who live there. Hi, Marie, and welcome! I have to say, I love the play on the Beatles song titles and I love the sound of these books! There has to be an overall cast of characters that is likable & that I can relate to in some way. It is good to see the interactions between them throughout the series. Humor is good, and an the feeling that they care about each other. I fall in love with the characters and am a glutton for all mentions :) I love when we get to know another couple but yet the previous couples make "cameos". I guess it's so gratifying to see them enjoying their HEAs :) Thanks for sharing and congrats to Marie on the new release! I do enjoy a good series and one of the things I enjoy most is revisiting the characters from previous books. I'm really looking forward to this new series! I love series because I like to see how people are doing after their book is over. When I read a book the characters become almost like friends and I want to stay in touch. :) This series sounds great, Marie. I don't know how you can keep up with 3 different series. Series give the author an opportunity to develop a character over a period of time. No quick personality shifts, just someone growing, maturing, and revealing parts of themselves a little at a time. I always hate to say goodbye to characters I have come to like. A series allows us to keep in touch with them and what is going on in their lives. Especially with series set in small towns, there is a closeness of community, and the town itself becomes a character of sorts. Fan girl squee here... thanks for the great interveiw!! I love the series style because the authors give more depth to their characters.. But I hate when the series end... it's like I've lost touch with good friends..